DR. SEUSS’ THE GRINCH - Arrives on Blu-ray February 5th! Enter to Win a Grinch Prize Pack Giveaway! 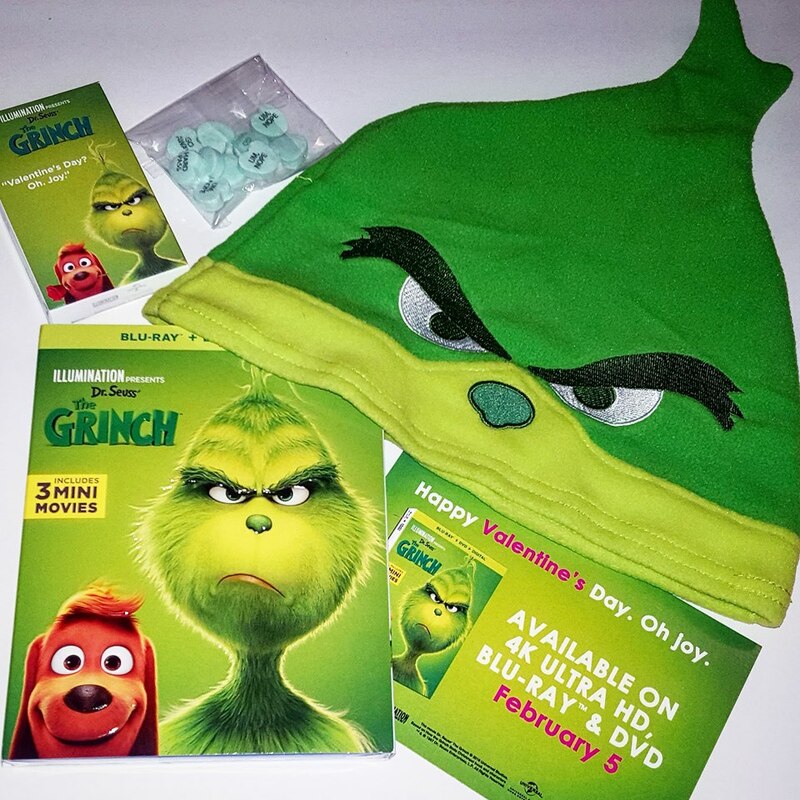 One lucky reader will win a fun Grinch Prize Pack including a Grinch Blu-Ray, a Grinch beanie hat, and Grinch Valentine’s Day Candy Conversation Hearts. Santa's Little Helpers – Fan favorites – the Minions – are back for another adventure! Having been accidentally dropped off at the North Pole, our Minion pals make the most of the situation by trying to become elves. From Green to Screen - It takes a lot to bring grumpy green to your home screen. This inside look at the making of Illumination’s Dr. Seuss’s TheGrinch features interviews and behind-the-scenes moments with the cast, filmmakers and artists whose hearts have all grown three sizes bringing this classic tale to life. Songs From His Little Heart - Take a deep dive into the toe-tapping beats of Dr. Seuss’s The Grinch. From score to specialty songs, you’ll hear from the film’s A-list musicians on what it took to create the music behind the movie. Any Who Can Draw - Hosted by an Illumination artist and head of story Mark O'Hare, you’ll see step-by-step how to draw some of your favorite characters from this beloved holiday classic; Grinch, Max, and Fred! 4K Ultra HD is the ultimate movie watching experience. 4K Ultra HD features the combination of 4K resolution for four times sharper picture than HD, and the color brilliance of High Dynamic Range (HDR) with immersive audio delivering a multi-dimensional sound experience. MOVIES ANYWHERE is the digital app that simplifies and enhances the digital movie collection and viewing experience by allowing consumers to access their favorite digital movies in one place when purchased or redeemed through participating digital retailers. Consumers can also redeem digital copy codes found ineligible Blu-rayTM and DVD disc packages from participating studios and stream or download them through Movies Anywhere. MOVIES ANYWHERE is only available in the United States. For more information, visit https://moviesanywhere.com. No, I'm not a mean one! I always try to be kind! I'd love to win so I can enjoy watching this with my grandsons!